The episode of the Claire Byrne Live show is available here, but RTÉ don't tend to leave them online for very long. This is the James Reynolds who was presented as a 'man in the street' speaking from the audience. Cllr Seamus Treanor, the anti-immigration councillor from Monaghan was identified, he falsely claimed that there are 900,000 Eastern Europeans in Ireland, the true figure is about one quarter of that. Norah Casey claimed that 400 children disappeared into child trafficking after arriving in Ireland. I can't find anything to verify this, and I have attempted to get in touch with her to ask for her source, so far without response. 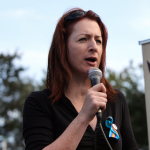 Clare Daly is the independent TD for Dublin North, originally elected for the Socialist Party. Pat McCormack is the deputy president of the ICMSA.